Michael White, Mayor of Lymington and Pennington and members of the Burrard Neale 250 Team Chairman Don Mackenzie and Schools Liaison Lead Pam Morrissey, visited Pennington Infants School this Tuesday the 20th of October to see and hear the wonderful way the school and teachers have used the “Life and Times” of Lymington naval hero Admiral Sir Harry Burrard Neale in their curriculum with Year Two children. Using education material originally designed for the Burrard Neale 250 Schools programme and put together by Burrard Neale 250 team member Pam Morrissey, the school has really embraced the topic and used the Life and Times on Admiral Sir Harry Burrard Neale in a host of imaginative and informative ways. The school led by Head Teacher Sarah Draper and teacher Mathew Butcher have led the children into research of the conditions endured by sailors in the Royal Navy during the Napoleonic Wars and studied the lives the sailors led including their diet, their living condition, their poor pay and the effects of the battles they undertook. Children wrote diaries as if they were sailors at the time and wrote formal letters to Sir Harry complaining about their conditions and used laptops to learn how to set out the letter using the correct fonts etc. Using Google maps they studied the various places in Lymington that were associated with the life of Sir Harry and made a pictorial map of the town learning about maps and how to read them. Art lessons were used to study pictures of Sir Harry in his full naval uniform and pupils all painted a picture of Sir Harry as well as making models of his ship. A large model of his ship enabled pupils to role play the life of sailors helping them to develop their speaking skill and leading to improved confidence in the class. The Mayor and Burrard Neale Team were extremely impressed with the range of ways that the school and the teachers had used the life of Sir Harry to enhance and inform so many different aspects of their school curriculum as the as well and the huge enthusiasm and knowledge of the pupils for the topics covered in this way. “One of our key aims when starting out with the Burrard Neale 250th Anniversary project was to bring the achievements of Sir Harry to wider public notice and Pam Morrissey our School Liaison Lead has worked tirelessly with local schools to help them introduce Sir Harry and his achievements both nationally and locally to their pupils.From the fantastic show put on for us by Pennington infants Schools we are certainly achieving this important aim of the project. Eight schools took part in our Burrand Neale Design a Poster competition and several schools have introduced the topic of Sir Harry into their curriculum. However Pennington Infants has been one of the most enthusiastic supporter of the Burrard Neale 250 project and have really used it as a springboard to take them into many aspects of the learning experience at the school, including art, models making, study of the life and times of sailors in Napoleonic times, role play and many other areas of school work. The evident enthusiasm of the children and their interested in what they had learnt was very compelling and we were all very impressed with the school and the teachers involved. We are also very pleased that the New Forest National Park Authority Education Service have adopted our material for their curriculum recommendations for all New Forest schools and schools in the Forest interested in introducing study on Sir Harry into their curriculum can find information on their website. Our celebrations of Admiral Sir Harry Burrard Neale’s glittering naval career were greatly enhanced by the arrival of two naval vessels in the Lymington River. The first to arrive was HMS Smiter (P272), an Archer class patrol and training vessel, otherwise known as a P2000. Smiter and her crew moored alongside the Royal Lymington Yacht Club, where she was open for inspection. Importantly, her crew, from the Southampton University Royal Naval Unit, was able to take active roles in three of our 16th September celebrations – the morning parade and ‘photo shoot’ at the Walhampton Monument and evening spectacular at St. Thomas’ Church … and a lunchtime reception at the RLYC in between. Also gracing the occasion, hosted by the Lymington Town Sailing Club and moored on the Dan Bran pontoon, was historic HMS Medusa (ML1387), a Harbour Defence Motor Launch, built at Poole in 1943. In May 1944 she took part in the practice assault carried out by American forces at Slapton Sands, Devon and on D-Day as a Navigation Leader marking the approach channels through minefields at Omaha Beach. Medusa has been fully restored to 1940s condition by Skipper Alan Watson and members of the Medusa Trust – who were kept busy during her visit to Lymington showing veterans and school-children around their beautiful vessel. 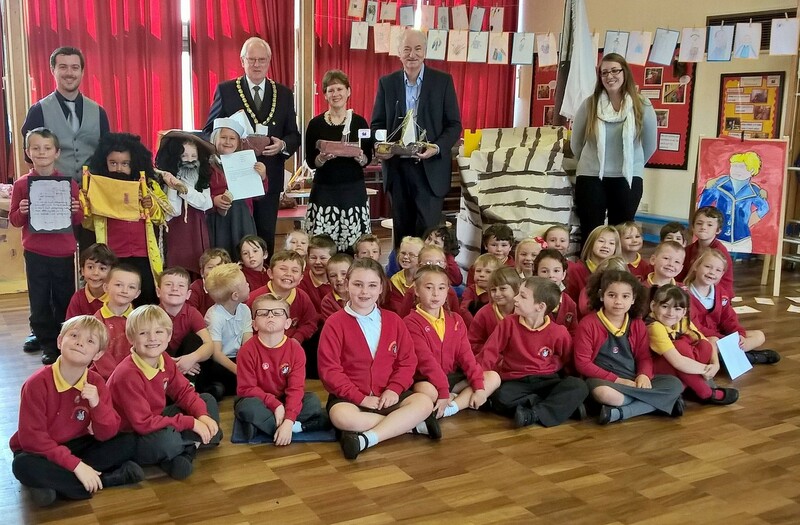 At our 250th Anniversary spectacular on 16th September, Town Mayor Cllr. 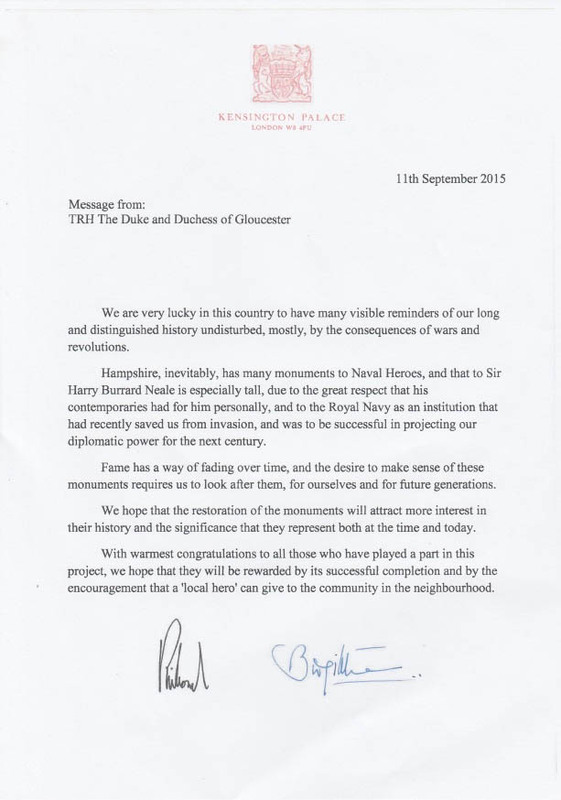 Michael White was pleased and proud to read 3 letters to the citizens of Lymington from 4 VIP supporters of our cause – Their Royal Highnesses The Duke and Duchess of Gloucester, Gordon Campbell, the High Commissioner for Canada and Gregor Robertson, Mayor of Vancouver. What were they all about? The then Duchess of Gloucester, a daughter of George III, was one of 3 members of the ‘Royal Family’ who, in 1840, headed the public subscription that raised £1,400 to pay for the erection of the magnificent obelisk that commemorates the life of Admiral Sir Harry Burrard Neale. “We are very lucky in this country to have many visible reminders of our long and distinguished history undisturbed, mostly, by the consequences of wars and revolutions. 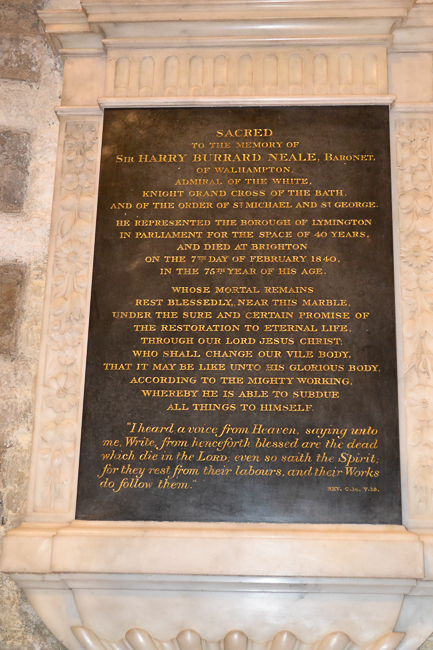 Hampshire, inevitably, has many monuments to Naval Heroes, and that to Sir Harry Burrard Neale is especially tall, due to the great respect that his contemporaries had for him personally, and to the Royal Navy as an institution that had recently saved us from invasion, and was to be successful in projecting our diplomatic power for the next century. Fame has a way of fading over time, and the desire to make sense of these monuments requires us to look after them, for ourselves and for future generations. We hope that the restoration of the monuments will attract more interest in their history and the significance that they represent both at the time and today. The letters to Lymington from Canada have equally fascinating explanations, because – at least until our efforts in the last year – it has been the case that the Burrard name has been better known in Vancouver than in Lymington! The principal inlet to the city from the Pacific Ocean is the ‘Burrard Inlet’, which is crossed by the impressive ‘Burrard Bridge’, carrying the mayor ‘Burrard Street’ etc. It transpires that Sir Harry never got nearer to Vancouver than the east coast of America – but had the site named after him by his friend Captain George Vancouver. We have, however, learnt that the City of Vancouver has, in its possession, a telescope presented to Sir Harry by Nelson in 1805! 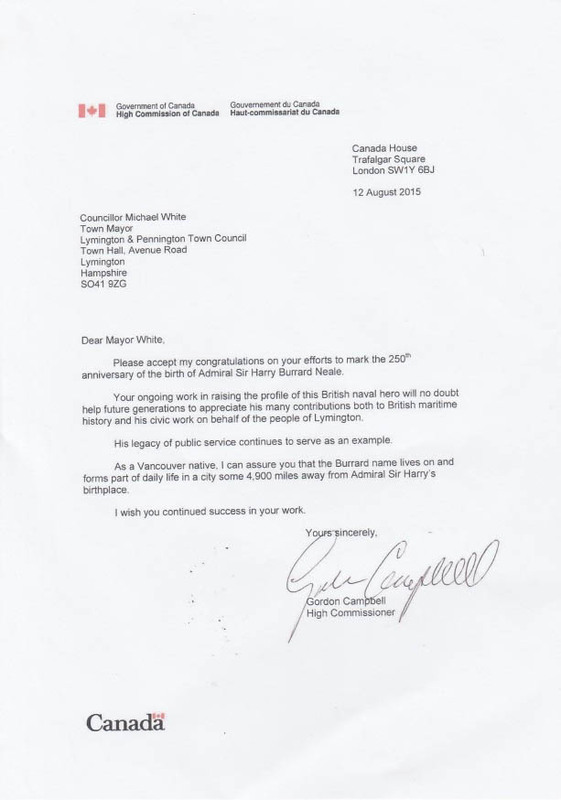 “Please accept my congratulations on your efforts to mark the 250th anniversary of the birth of Admiral Sir Harry Burrard Neale. Your ongoing work in raising the profile of this British naval hero will no doubt help future generations to appreciate his many contributions both to British maritime history and his civic work on behalf of the people of Lymington. His legacy of public service continues to serve as an example. 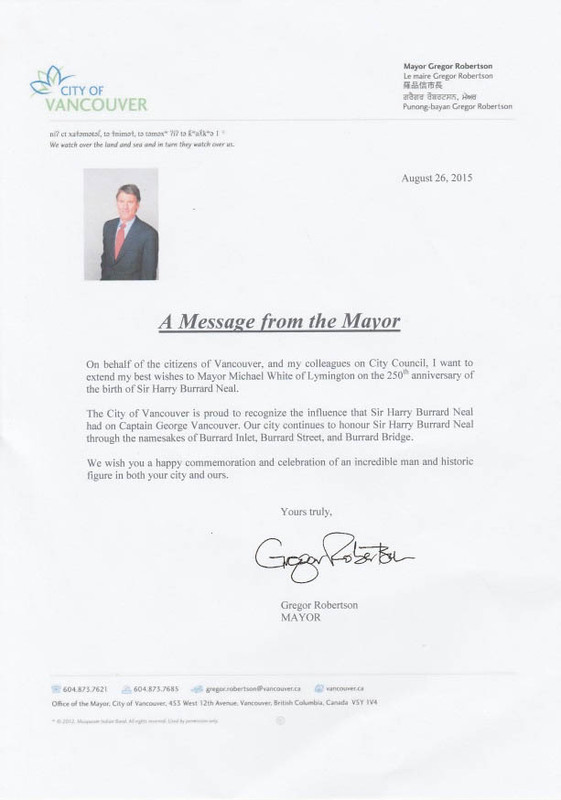 “On behalf of the citizens of Vancouver, and my colleagues on City Council, I want to extend my best wishes to Mayor Michael White of Lymington on the 250th anniversary of the birth of Sir Harry Burrard Neale. The City of Vancouver is proud to recognise the influence that Sir Harry Burrard Neale had on Captain George Vancouver. Our city continues to honour Sir Harry Burrard Neale through the namesakes of Burrard Inlet, Burrard Street, and Burrard Bridge. 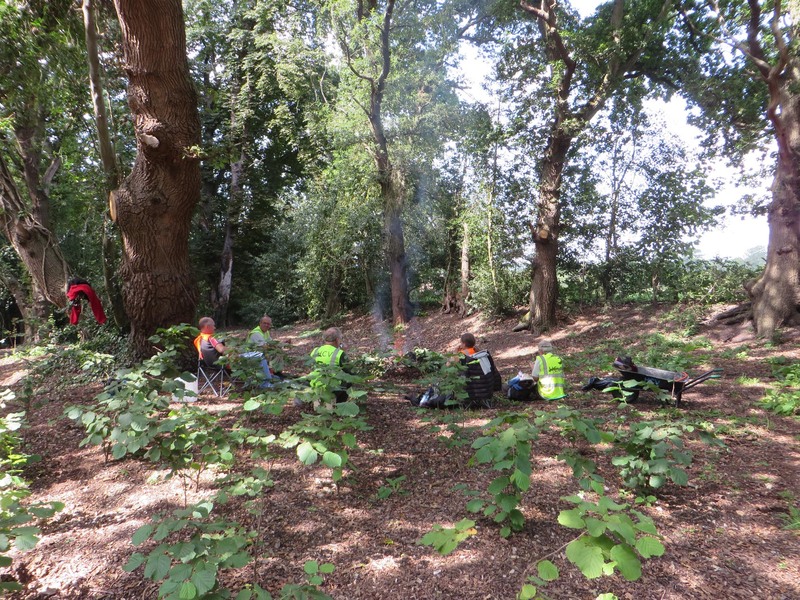 Improving the state of the grounds in which the Walhampton Monument stands has always been listed as Phase 2 of the ‘BN250’ project, following the priority of raising awareness of Sir Harry. Our resources are scarce but, bit by bit, the ‘jungle’ has been cleared and the planned ‘parkland’ setting of the future is taking shape.